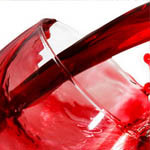 Wine is full of hundreds of chemicals that carry health benefits called polyphenols, among these resveratrol is found. Resveratrol is found also in grape juice, cranberry juice and peanuts, yet it is found in much larger amounts in red wine. While research on resveratrol is in its early stages, observations are hopeful. Research has shown that resveratrol possesses anticancer potential and has the capacity to interfere with many processes essential to the growth of tumors. Studies show that resveratrol is absorbed quickly in the body and can act rapidly on cells. In animal model studies it has been proven effective against the development of esophageal, colon and breast cancer. Patients that had breast cancer on the other hand should be cautioned as in one study it was found that drinking just three glasses of wine a week increases by 30 percent the risk of breast cancer returning.